The demo version of MDF file password recovery software shows you password hints of the newly generated database passwords and also renders a preview of the user account Login ID in it. 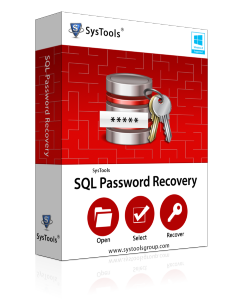 The tool helps you to recover MS SQL Server SA password in case you have lost or forgotten it and wish to reset it. You can check whether the tool, which you are choosing for MDF database password recovery, is reliable or not. You can check how this software will bring back your lost MDF password. 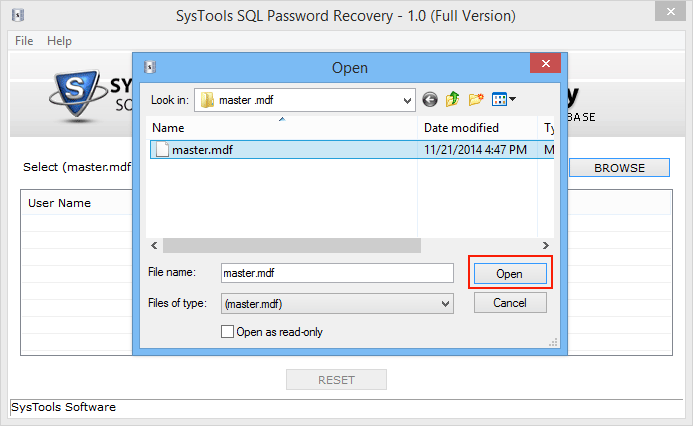 You can see how you have to carry out MS SQL SA password recovery process with the tool. You can know whether the tool, which you are selecting, is quick in SQL password retrieval process or not. You can figure out whether the software is simple in use and better in quality or not. 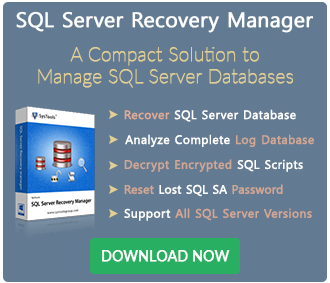 MS SQL database password recovery is an advanced solution to reset lost SA password. The software is developed with excellent techniques that allow users to recover sql database user password and set a new password for their user accounts. With the help of this SQL MDF password recovery you can easily recover password of any length or any character combination. The software helps you to reset SQL Server database password in case you have lost or forgotten it and wish to reset it. SQL Server password reset tool has the potential to recover lost SQL user password as well as SA password. With the help of this utility you can recover password of any character length or any character combination like numeric, alphanumeric, symbols, etc. 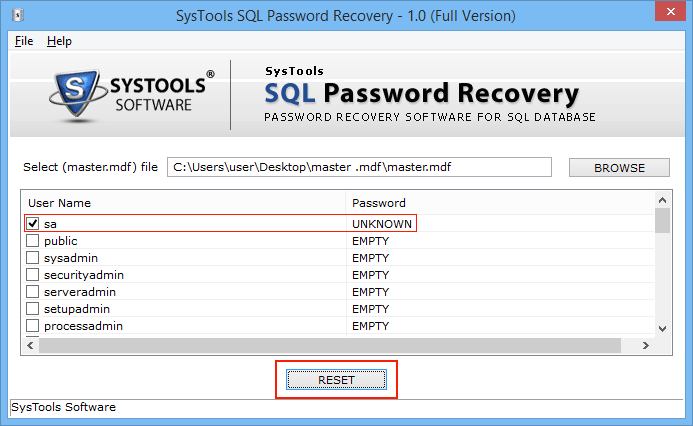 Once you load the master.mdf file, SQL password recovery tool will show you the list of entire users created in SQL Server and allows to remove multiple user passwords. This advanced utility allows user to reset lost SQL SA password from SQL Server 2017, 2016 and all below versions. MS SQL Server password recovery software is specially designed for Windows users and supports Windows 10 and other previous versions. The Graphical User Interface makes the software easily operable. Even a non technical user can easily recover lost SQL password. 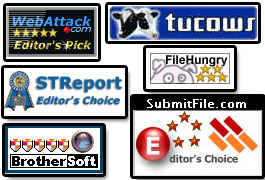 What are the capabilities of SQL password recovery freeware version? The free version is for trial purpose and will only list the user present in master.mdf file. But if you want to recover SQL password, then you have to purchase the licensed version of the software. Does the software require SQL Server environment to reset lost SA password? Yes, you need SQL environment for running this SQL Server password recovery tool , but at the time of password recovery process you need to stop the SQL Server services. Can this software recover password of SQL Server 2017 database? Yes, this utility recovers lost SQL password for SQL Server 2017 and all the below versions. Does this software recover MS SQL Server SA password? 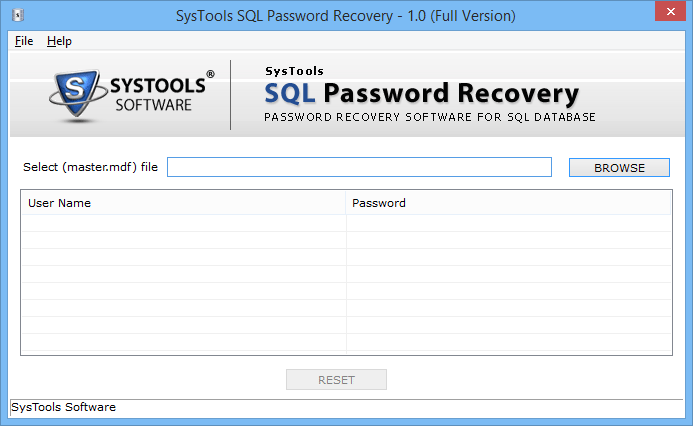 Yes, MS SQL password recovery software is well capable of recovering SQL SA password and user password.